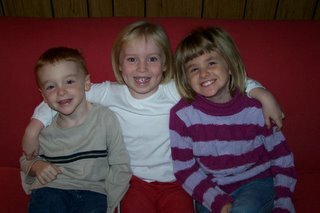 This is a picture of my two adorable nieces and my handsome nephew. Aren't they the cutest? It's amazing how calm they look here. They do not behave this way when they're together. They're like crazed maniacs, running all over, screaming, jumping/climbing on you, and the like. They're very sweet though, when they slow down for a minute. You know you're old when you go to parties with food. Isn't it true? When I walk into a party with a huge spread (both alcohol and food), I feel old. And I dread the day I have to host one of these 'adult' parties. What happened to the good ol' days when a keg was enough? You had a party when you and your friends (or roommates or whatever) could scrape up enough money to purchase the keg, then reimbursed yourselves by charging money at the door. Sometimes you even made a buck or two. Everyone was going to stop at White Castles or Taco Bell on the way home anyway, so who needed food? The point was to get drunk fast. Food only got in the way. Now I guess it's there to sop up some of the alcohol in hopes of not getting too drunk too fast. Both Q and I were dually impressed and repulsed by this revelation. Impressed because I'm not usually one for huge revelations (that I share anyway), and repulsed by the truth of the situation. The party that instigated this revelation continued to hammer the point home. It was semi-formal (which led Q to shave a mohawk into his hair - he was going to shave it anyway, though - always the jokester! ), had a full and very well stocked bar, great food, and great decorations. It was the ultimate anti-college party. The host was a co-worker of Q's, so as far as we knew, the party was going to be only co-workers and spouses, sig others, etc. So the best part was Q walking in to a house filled with half social workers and half gay men (friends of the host). Needless to say, Q, with a mohawk, studded metal belt, and steel-toed Docs, caused quite a stir. Q has to look 'normal' at his job, so he uses every opportunity he can to shock his co-workers. This is only funny because anyone who knows Q knows that he's so not a skinhead whatsoever, and usually doesn't look like one much less act like one. He's the exact opposite. It was hilarious. Usually I hate parties where I know so few people, but I was delirious, what with the revelation, the wonderful alcoholic punch and full bar, and Q sticking out like a sore thumb. I was pleasant, talkative, engaging in small talk, and otherwise so not like my usual self. The host's friends were funny and delightful, and who could forget the very drunk host shouting 'What happened to Baby Jesus!' and 'Did he put Baby Jesus down his pants?' Unbeknownst to the host then and possibly even now, someone put Baby Jesus in the chandelier. This could have been very offensive to a certain crowd (not me, of course), but here, it was just hilarious. I'm laughing now (internally, dear reader, so as my bosses don't think I'm goofing off) just thinking about it and the fact that it might be in the chandelier even as I type. Ahh, good times. I hear you on the party front. I can't believe know when I throw a party I'm expected to furnish the food and drink. Apparantly BYOB doesn't cut it when you're over 30.